Though I can’t answer the question, I do recall that in my former employment, it was notable when three men all having the same first name worked in the same department. So what can you say about “The One-Legged Jims,” a group of three Civil War veterans? 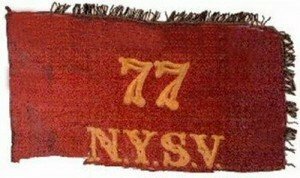 Among the many Union outfits filled by soldiers from upstate New York was Company A, 77th Regiment, NYS Volunteers. Enlistment sites, always plentiful, included Chatham, about twenty-five miles south of Albany, and Westport, on the shore of Lake Champlain. The interest here focuses on three enlistees: James G. Allen, 39- James E. Barnes, 35- and James A. Lawrence, 19. Barnes and Lawrence mustered in at Westport on October 1, 1861, while Allen mustered in at Chatham on February 4, 1864. All three served in Company A, 77th Regiment. Even though there’s more than a two-year span between their muster dates, they all ended up serving at the same time in 1864. Three Jims, same regiment, same company?no big deal. 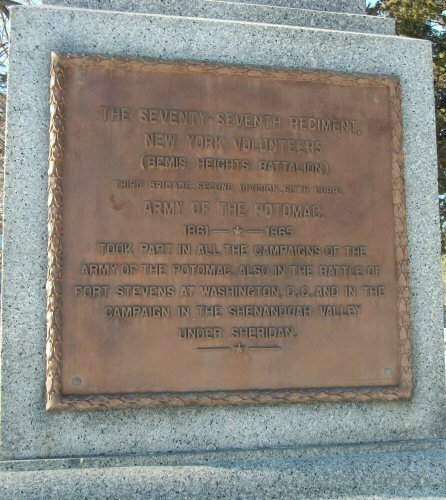 In June of that year, the men of the 77th were joined in battle at Petersburg, Virginia. During a lull, the troops relaxed behind breastworks (barriers to protect from ground attack). Many of them laid down to rest, talking and joking among themselves to ease the tensions of war. Within their midst, by mere coincidence lying side by side (by side), were the three aforementioned Jims. But for the quick work and dedication of medical personnel, the three Jims with mangled legs might have died on the spot. The surgeon gave each a glass of brandy, administered chloroform, and went to work. Within thirty minutes, three limbs were amputated, the remaining stumps were treated and bandaged, and the men were in ambulances. Their destination was City Point, eleven miles away, where they arrived within three hours of being wounded. The speedy effort saved their lives. Later, all three were transferred to Stanton General Hospital in Washington. One shell, three legs lost … three left legs … and three one-legged survivors, all named Jim. What are the chances? The coincidence wasn’t lost on anyone, and it earned the men plenty of extra attention during their recovery. In the years to come, they became known informally as The One-Legged Jims. Their story developed into a sort of military urban legend: men would tell it as an incredible army tale from their own outfit, perhaps not aware that it was, in fact, a true story taken from New York’s 77th. 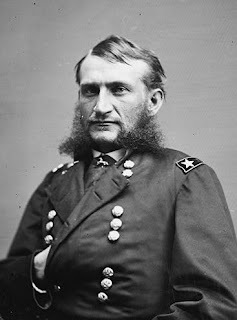 After the war, Jim Lawrence eventually moved west, but Barnes remained in his hometown of Westport. At veterans’ GAR (Grand Army of the Republic) reunions across the state, he became known as the best of storytellers. The highlight, of course, was the retelling of how The One-Legged Jims, a very exclusive club, came into being. Many of the listeners had been present when the shell exploded. He was always careful to describe the treatment and efficiency of the surgeon and others who worked so hard to keep them alive every step of the way. Barnes made his mark outside the military as well. A pension (equal to $800 a month today) for the loss of his leg helped financially, but he also worked. Those who follow the history of Lake Champlain might recognize James Barnes as the first keeper of Barber’s Point Lighthouse when it opened in 1873. For the remainder of his life, Barnes attended GAR gatherings. The best one of all, from his perspective, came in 1884, when the annual reunion of the 77th Regiment was held at Westport. Jim’s stories were a highlight of the affair. Over the years, from Saratoga to Plattsburgh, he entertained folks in like manner at veterans’ events and made many friends. The 1890 reunion was remembered by many as both sweet and bittersweet. Jim Lawrence, the only other surviving member of The One-Legged Jims, came all the way from Nebraska, reconnecting with his friend and sharing stories from the past. It was fortunate that he did. 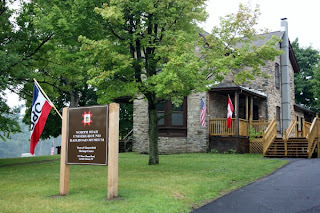 After the Gloversville reunion, Barnes headed for Westport, but stopped to visit a friend at Fort Ann in Washington County. While there, he was felled by a stroke and never made it home alive. Photos: A monument to the men of the 77th- the crimson silk flank marker of New York’s 77th Regiment.